As for materials of this project, I will be using many bricks for seating, grass for walking on, native plants for aesthetics, crushed stone for other walking paths, and other materials. 20 Concrete seating stones, $100 per stone, total ~ $2000. These stones are flat and colored black/brown. They are about 1.5 feet deep by 2 feet wide by 2 feet tall and can comfortably fit one person per stone. They are shaped and cut at angles as to create a circle shape when placed one next to each other. 13 Standing stones (in teacher circle), $15 per stone, total ~ $195. These are 6 in deep stones that will have their top level with the surrounding grass as an area where the teacher may stand to lecture. They will be cut in different shapes, according to the diagram and be colored red/black to slightly contrast with the earth tones around the classroom. Crushed limestone, 600 square feet 2 inch deep, $1/sq. ft., total ~ $600. This is crushed stone used for the main pathway from the school building to the outdoor classroom. The amount of stone required for this path will be determined by how far away the classroom is from the school building. This estimate is for a 3-foot wide pathway 200 feet long. Grass seed, 400 square feet, $.50/ sq. ft., total ~ $200. This is the grass seed used within the main area of the outdoor classroom. In areas of primarily shade, Creeping Red Fescue, Festuca rubra, should be used because it is a cool season grass used in high-shade areas and requires low input of mowing, fertilization, and irrigation. In areas of more sun, a Tall Fescue (Festuca arundinacea) should be used to tolerate drought conditions. Both species have moderate wear resistance. These plants are all perennial, meaning they grow back after every winter season. They are great because they require minimal maintenance, yet they provide for different colors, textures, and varieties for the outdoor classroom, and will prosper in the shade of the outdoor classroom. When placed around the classroom, they give students the opportunities to see all that nature has to offer. Also, some classes may use differences in leaves and flowers for science or identification projects. Grass varieties such as Big Bluestem Andropogon gerardii, and Switch Grass Panicum virgatum, and others can also be used throughout the nature trail and in the brush/tree area to provide for more variety of plants to observe. It is important to note that the number of plants and grasses put into this outdoor classroom area will depend largely upon the usable amount of space. If a nature trail is not included, the number of plants will be reduced dramatically, perhaps down to 20-30. This area would include many native varieties of grasses, shrubs, and trees. Schools and developers should take note of the plant varieties listed on this report as well as their potential mature size as to appropriate space for each plant. The more random the plant varieties are planted throughout the classroom area, the more pleasing they will be to observe. 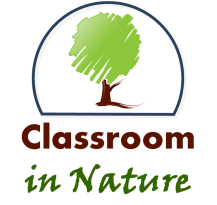 There are some shrub and tree varieties labeled on the picture of the outdoor classroom. This can be used as a starting model for where certain plants and trees can be placed. These trees will have a large range in cost depending on the number needed, and how old they are. I would recommend trying to save any existing trees around the outdoor classroom. Cost – about $50 per tree, 20 trees ~ $1000. Hardwood shredded bark mulch will be used for the nature trail. At 1000 feet long and about 4 feet wide, will consist of 4000 square feet, plus another 10 square feet for the flower beds. Some communities offer free shredded bark mulch to community members or businesses, resulting in a $0 cost. If no such service is available, cost may range around $700. Also, forest debris will contribute to the path surface, resulting in free mulch.